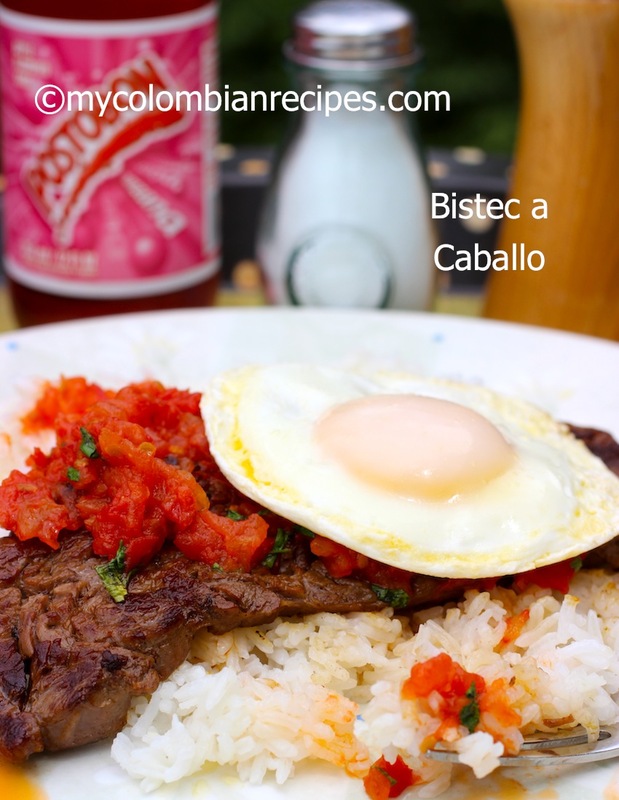 Bistec a Caballo is made with skirt steak or flank steak and is delicious, try it! Place the steaks between sheets of wax paper, then pound until each steak is about ¼ inch thick. Place the pounded steaks in a zip lock plastic bag. Add the mustard, oregano, cumin, garlic, cilantro, salt and pepper. Refrigerate for 1 hour or overnight. Be sure the steaks are evenly covered. In a large skillet, heat the olive oil over medium heat. Place the steaks into the skillet and cook for 3 minutes per side. 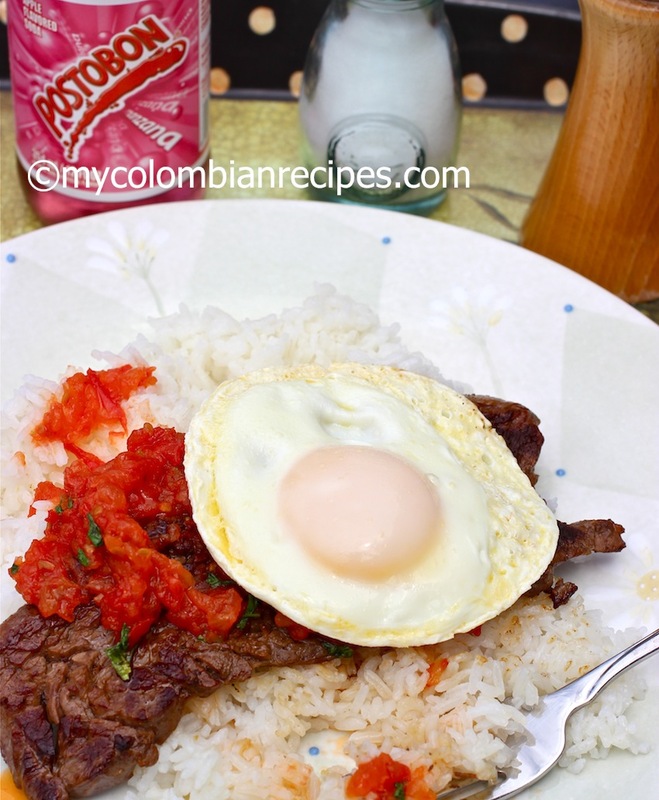 To serve: Pour hogao over the steaks and top with a fried egg. Its name is so funny! And I like the idea of combining steak and egg in this shape. oh dear and here i am thinking it was horse steak hahha! It translates into horse steak in my language! Lol thAts too funny. But it’s real delish. It is spelled Colombia not Columbia. 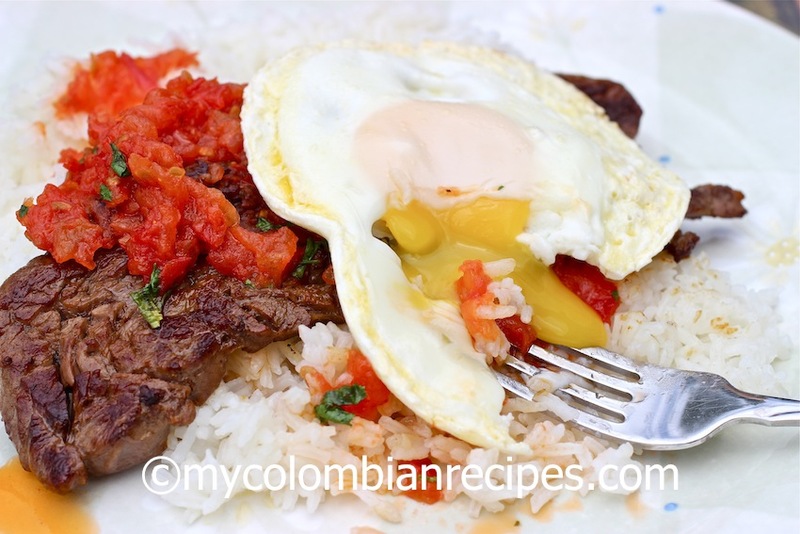 Fried egg and steak-perfect combination! I think steak and eggs make a delicious combination. Horse steak is pretty funny. I think it’s ‘a caballo’ because it’s on top. Like when you get on a horse. P.S. I love fried egg ‘a caballo’ with rice + beans. OH my word this looks so good! I know I would love this! Love the name and the fried egg on top is awesome! I like the name…the onion steak looks pretty and yummy. Thank you all for the nice comments! Glad you all are liking Colombian food! That is really an interesting name… Maybe it is called that because the egg is riding the steak? or it was probably made with horse meat first? either way it looks delicious, especially the salsa. This is perfect! I like my steak nice and thin and topped with the fried egg, mmmm!! Delicious! Great post!! oh boy does that look awesome! I bet I could get my husband to eat breakfast (he’s not really a breakfast eater) if I served this to him! I’m going to have to give this one a try for sure! I’m so glad you posted this. YUM! I’m so upset that I’m so behind in my blog reading…this looks amazing! My husband is suspect of egg with non-traditional American foods, but I’m determined to convert him! ha ha I too thought maybe it was a horse steak or something… funny me. It looks great! another great dish. I just recalled that I think I saw a Columbian restaurant in the Mission District here in SF, I must check it out as reading your posts always makes me hungary. 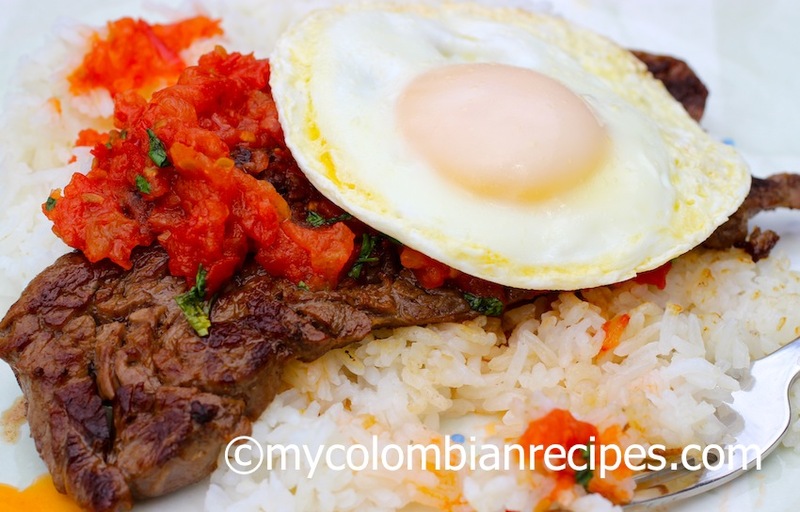 Hola, cooked this sunday , it was great, my husband said that it remimded him of ” bistec a lo pobre” from peru. Love sandra g.
Thank you for your feedback! Glad you liked it! 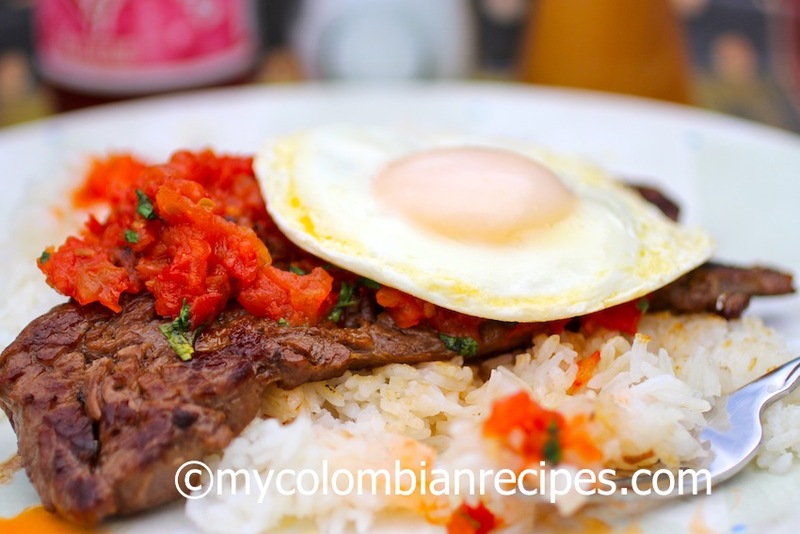 hmmm steak and eggs Columbian style, this is something to try! My mom makes this, I love this dish! Erica, quick question…when you indicate the use of mustard, are you talking about standard mustard, Dijon or podwered mustard?…would the quantities change according to selection? 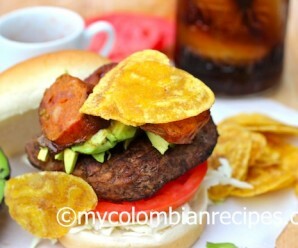 Many Thanks and can’t wait to try this recipe…I am becoming very popular among my circle of friends…they are asking for recipes and the funny part they are all “gringos”….way to go Erica! Jorge- I use regular mustard.The flavor will be different if you use a different kind of mustard! Love this dish. Very easy and everyone loved it!!!!!!! I made this for my COLOMBIAN mom this weekend and she loved it! Thank you for the recipe. It was perfect. Looks like something I could have right now for breakfast! I loved this steak, my boys loved it an my husband did too!!!! I’m hooked on your recipes Erica!!!! Thank you sooooo much!!!!! By the way I am Colombian myself from Medellin and lived in Cartagena for about 9 years, then came to USA. My mom makes things a little different way, I love to alternate between your recipes and hers! Thank you soo much!!!! I am so happy I found this great site. I am always home sick and miss my typical food. 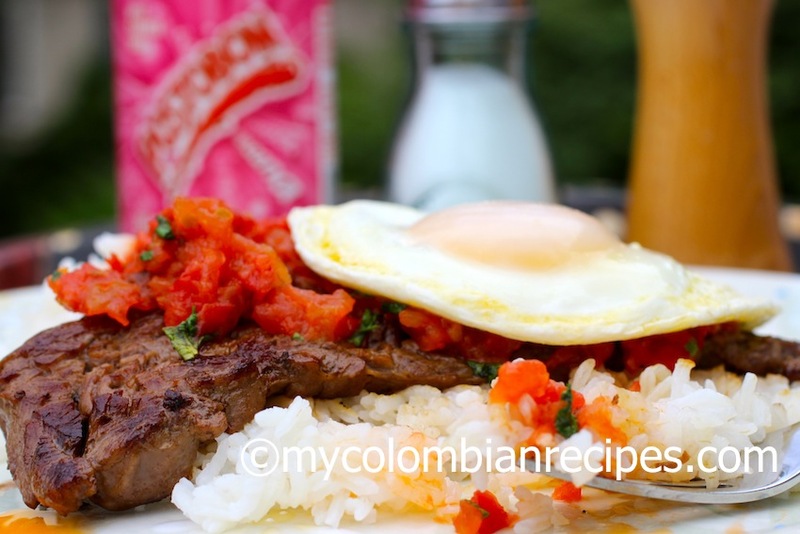 My husband always bothered me cause I dint know how to cook colombian food. 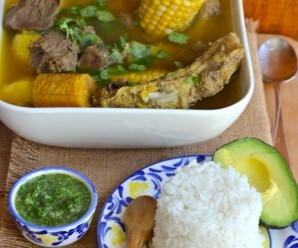 But now at least once a week I make one of your colombian dishes! Today I’m making this. This recipe came out perfect! Thank you for posting, I enjoyed making and eating it. 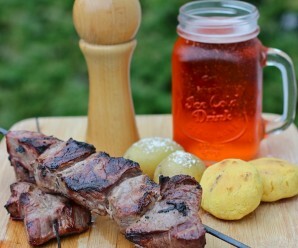 Esta receta tan deliciosa la hemos adaptado a nuestra cocina criolla aunque el origen en realidad es ruso. Lo cual no es inusual ya que muchísimas de las recetas en toda América son el resultado de un sincretismo mundial, exceptuando la cocina de los pueblos originarios de América. Dios la tenga en la gloria –este era el plato favorito de mi viejita. En Puerto Rico tambien lo llamamos “a caballo, ” un biftec, arroz y habichuelas con un huevo frito, y como dije era el plato favorito de mi mama. This “a caballo” expression is used in Spaniard, Latin American cuisine and French cuisine (à cheval), and its related to the way to prepare and serve a plate. Is usually a piece of meat with eggs on top. However, the English way (Horseback) could be an appetizer like scallops wrapped in bacon that are on top of a toast. In other words: one thing on top of the other makes it “a caballo”. This was incredibly delicious. Thank you for sharing this recipe.